Medicated Follower of Fashion: Saturday is Caption Day! That's the last time she feeds me Onion Soup for breakfast! Mwahhaaaahaaa. Mmmm, I love onion soup! Can you imagine the smells toddlers would make after eating onion soup though.. This is a funny looking apple Mum. Will it taste as good! 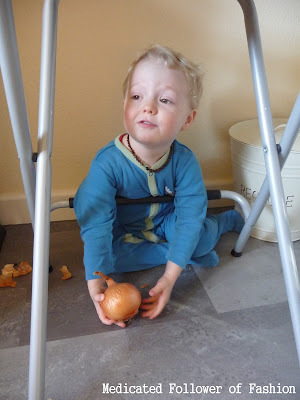 The imagination of a child... an onion makes for a fab bomb. Haha.. it does, they are messy! His parents couldn't afford a real football! Mummy won't buy me that toy. Hmmmph! I'll just hide under the table peeling this onion until I have enough tears for a sympathy present. Mwahahahaha.